New Columbia Heights: First look at Park View Patio, new bar with huge patio in Blue Banana space on Georgia, opening Thurs. First look at Park View Patio, new bar with huge patio in Blue Banana space on Georgia, opening Thurs. This weekend a few friends and I checked out Park View Patio, a new bar that replaced the Blue Banana sports bar at 3632 Georgia Avenue NW, between the Looking Glass Lounge and DC Reynolds. 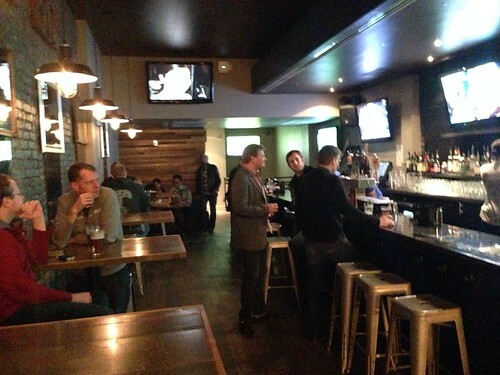 The bar has new owners and a new feel -- there are still a number of TVs, but the inside is a bit more hip with dark colors and mirrors. The main attraction to me though is the back patio, which is huge and filled with picnic tables. The Blue Banana never really utilized their patio area, while Park View Patio has expanded all the way back to the alley (the same depth as DC Reynolds) and took over the next door lot's back area. It's massive, with two bars, and I think it would be great for springtime. I chatted with Scott, one of the owners, and he said they also plan to install a 40 foot retractable tent with clear ceiling, plus heaters, so it could be a good place for the cold weather as well. They'll be open Thursday-Sunday at first and will have buy one-get one free happy hours from 6-9pm each of those days. The interior space is similar to when it was the Blue Banana, though it looks more open -- they took out the wall that was on the side when you come in. They plan to have DJs often and I get the feeling it'll still be a good place to watch football on Saturdays and Sundays or other sporting events since they still have the TVs. The owners also own a couple of places in Georgetown and Cleveland Park called George, Mason Inn and Capitale, with which I'm not familiar. Apparently George is members only, but Park View Patio sounds more laid-back than the other spots. Scott also mentioned that he didn't think competition between the bars in the area was a bad thing -- if anything, they have different themes and the more places, the more people will come to the area. I agree with that. It'll be interesting to see how Park View Patio develops, and nice to see something replace the Blue Banana -- which I sort of liked, but it never really had an identity aside from a place to watch games. The patio and food should change that for this new place. It's a similar idea to DC Reynolds though, so we'll see. What do you think? Excited? There are a few more photos below. 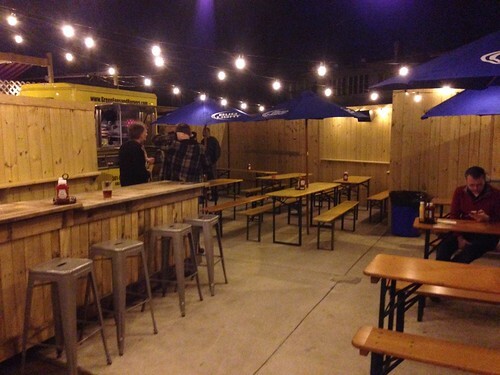 The second outdoor bar (third total) to be opened in big crowds. That's DC Reynolds through the slats. I'm looking forward to hanging out there. Big bonus if they offer a hot food menu! I say the more options in Petworth/Park View, the meerier! 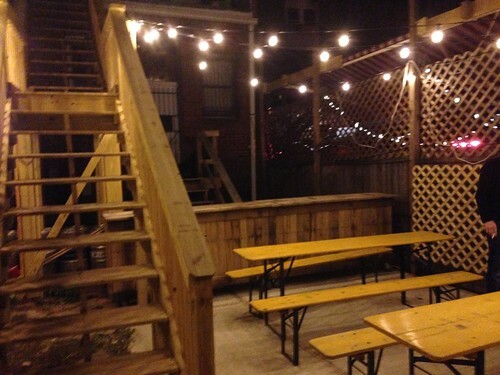 Welcome to the neighborhood, Park View Patio! Agreed! And yes, they will have a full food menu from an actual kitchen, rather than heated up stuff like the Blue Banana. El Chucho now serving brunch! Whoa! Just hit two million views for the blog!